Proper fire extinguisher use can save lives. Whenever a fire breaks out, the first thing people reach for is a fire extinguisher. But do they really know how to use it? In fact, people will do their best to stop a fire, but they can only do so much with the information they have. That is why knowing the best practices when it comes to safely using a fire extinguisher becomes so important. Here are some things to keep in mind when using any fire extinguisher to combat a blaze. Staying safe while fighting a fire is important. In fact, it is important to alert anyone in your house or business of a fire as soon as you notice it. Before you even attempt to use a fire extinguisher, you must dissect the situation. Analyze whether this blaze is something you can tackle or if you need reinforcement- professionals. If the fire is small enough for you tackle on your own, grab an extinguisher when you can. Be sure to continue to exercise as much caution as you possibly can. Then, once the extinguisher is used, be sure to report the use. That is a must when it comes to proper usage of fire extinguishers. Most fire extinguishers must be recharged after they are used. The next thing you’ll want to do is be detail-oriented and actually pay attention to the label on the actual fire extinguisher. In fact, being so vigilant will allow you to know how to properly use one. These directions will help guide you towards properly facilitating the fire extinguisher without getting injured. Regular inspection is key in any fire safety discussion. 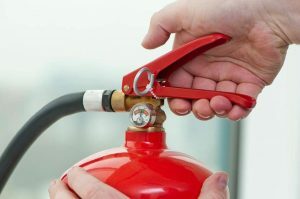 In fact, there are specific standards set out in the NFPA guidelines that explain when and how frequently you should get your fire extinguisher and other fire systems inspected. This entry was posted on Thursday, September 27th, 2018 at 10:54 am. Both comments and pings are currently closed.